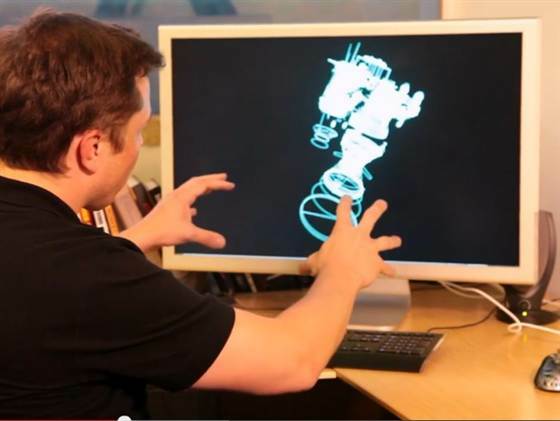 SpaceX founder Elon Musk, with his usual eye to the future, released a video Wednesday showing off a high-tech method of interacting with the 3-D models used to build rocket engines and the like. It's not quite ready for prime time, but it could be a preview of how we make such things in a decade or so. Computer-aided design (CAD) users have been manipulating and editing objects in three dimensions for a long time now, but doing so on a 2-D display via specialized mice and keyboards has its limitations. Enter the recently released Leap Motion device, which tracks hands and objects in its vicinity using infrared light. We've found it to be remarkably accurate but lacking in applications — but Musk and his team gave it a reason to exist. By hooking the Leap up to the 3-D modeling software, models of engines and parts can be manipulated with intuitive gestures like grabbing and turning in the air. Add in a 3-D display or virtual reality headset like the Oculus Rift, and it must be quite a step up from the desktop version. Of course, these methods don't yet have the precision or power that professional CAD tools have. A part might need to be designed with precision down to a fraction of a millimeter — and neither the Leap Motion nor our everyday hand gestures are that good. That said, Musk seems confident that these natural gesture-based ways of manipulating and editing 3-D models will eventually become common among engineers and designers. At the very least, it looks like a lot more fun than a mouse and keyboard. By Devin Coldewey. We found it on NBC News Digital.